Today, Nintendo Japan ran a special Animal Crossing-themed Nintendo Direct, which you can watch using the video link below. The video was devoted to the forthcoming 3DS release Animal Crossing: Jump Out. The game is released in Japan on November 8th. I think this just is a piece of plain awesomeness! This game will revolutionize the franchise surely! So many new changes!!! Best AC yet! Love that tropical island. Satoru Iwata looks like a real mayor, since I have his mii on my 3DS I'll use his character for this game! That megaphone looks like it would be used for the voice chat function! i was already totally hyped before this video, but now...oh man i am going nuts!!! i wonder why ikea hasnt already tried to make productplacement with this game. Graaasss :} Look at all the pretty grass. I wonder how long until it all dies under my feet. Ah man! The video won't show up! It sure sounds awesome though. You can talk to human characters you make! Tom Nook: Does anyone need a loan to purchase this game, hmm? So did they send out a animal crossing StreetPass puzzle like they do every other game spacific ND? Gyroidssss!!!! YES, they are back!!! @MrWalkieTalkie I would be silly if it weren't. I'd also buy it digitally. @akabenjy speaking of downloading AC:JO, is it possible to own both the physical and digital copies? @Moshugan I'm slightly reluctant to download it due to the 3DS not being account based, like something you could access online. Good thing it's planned to release in 2013. Wow, two minutes in and they've all ready shown a ton of new things (and some old things)! This is going to be awesome. This why I have a 3DS and I'm stoked soo much new stuff is getting introduced this time around! 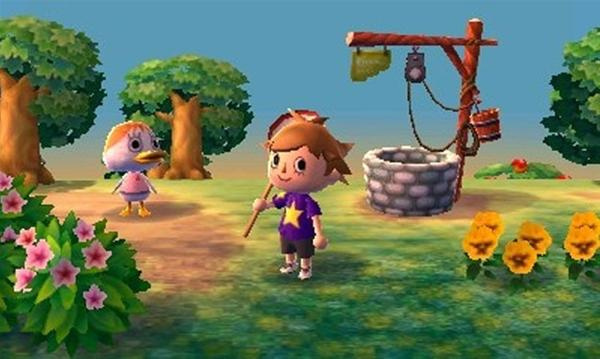 I agree with whichever above comment it was, this is going to be the best animal crossing EVAH! Looks cool. Hopefully someone has the time to put subtitles in English on the video. @AyeHaley To be fair, there was a tropical island in the GameCube version. However, it was only accessible by plugging your GBA into your CameCube and visiting the docks at the beach. If you did get there, there was an absurdly simple way to earn maybe 30,000 Bells a hour. That is just ridiculous. That sound you just heard. That was @James, secretly enjoying his exclusive already translated copy of Animal Crossing in NoE's secret party room. Ultimate Animal Crossing. The amount of new content is incredible. That is just so gorgeous, and all the new things to do. Sigh.... can't wait. Wild World didn't have disappearing grass - at least I never experienced it. I do hope it doesn't happen in this game. Oh, by the way Nintendo - pleease, pleease, make sure the Tatami Mat and Shoji Screen are in the EU release this time. I HATED getting a Dungeon wall and floor instead. This looks to be the best in the series since the original! So excited for this. Interesting K.K. Slider part they threw in there, with the Club 444? Seems pretty groovtastic. I also like them bringing back the island. This game's going to be so amazing, I'm hoping for an early 2013 release. Not an animal crossing man myself, but must say, it looks amazing. I watched the whole thing now. Iwata actually confirmed that it will also be available in eShop. Looking so great! A perfect portable game. @Schroedus Thats a good question. I'm assuming you would have to buy two copies of the game though. I must have this game!!! I also wish I understood what they were saying and such. is that a coffin for sale in the store??? check at 5:45 in the video...curiouser and curiouser. WOW they added a lot new content!! This is going to be so awesome!!! Cannot wait any longer!!! If the video was in english I would have understood some stuff that was going on in the video there but who cares! I want so badly!! That Kirby T Shirt is amazing I want the game now!! Each video adds a ton of new features. It's almost ridiuclous how much deeper this is than CF or WW. @HarmoKnight Yes I want that.